Complete the eRequisition form and send your referral off to the referral site. Complete the eReferral form, as required. If you initiated the referral from an integrated EMR, patient contact information and other required details will be automatically pre-populated. Complete the remaining fields as required. If necessary, you can add attachments to your referral. To generate PDF attachments from your EMR, please refer to this article: Creating a PDF Attachment. If you are sending an eReferral as a delegate, you will need to select the appropriate provider that you are referring on behalf of (from the dropdown menu at the top of the "Referrer Information" panel). Click the "eRefer" button to send your eReferral. Note: If the referral listing you are sending to is under a regional authority, you must accept the agreement located beside the “eRefer” button the first time an eReferral is being submitted. 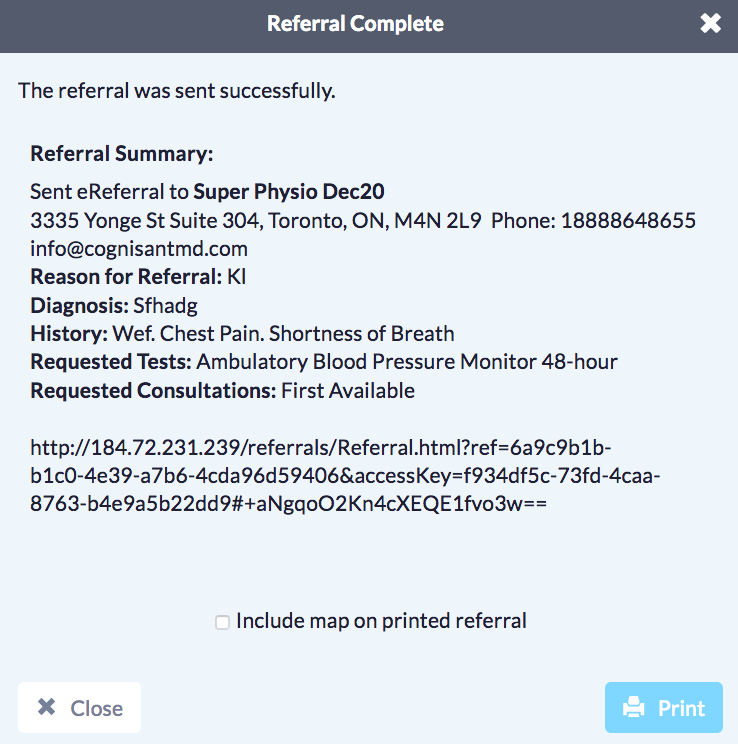 Once sent, you will see a confirmation window with the option to print a copy of the referral for the patient. The eReferral will then be documented in the patient's chart. The referral note and Ocean eReferral form are automatically downloaded into the patient chart. An internal PS message can also be triggered to the PS user/group of your choice, so they can follow up on the referral, in the specified number of days. The referral summary will have automatically downloaded in the patient’s Encounter Notes. Click the “Download” button from the Ocean Toolbar to populate the eReferral information into the progress notes section of the patient’s Encounter chart. If you are using a non-integrated EMR, you can copy and paste the information from the confirmation window directly into your patient's chart in your EMR.